The general rule is that ‘entertaining’ isn’t tax deductible however staff entertaining is, always. All costs of a staff function from food, drink, entertainment, venue hire and even accommodation are allowable. And VAT registered businesses can recover the VAT incurred. There is no limit to the amount a business can claim in respect of staff entertaining providing there is no ‘motive behind the expenditure. There are some restrictions and a catch! The first problem is that Sole Traders and Business Partners are Proprietors and not ‘staff’ so entertaining for them alone is not allowable, there need to be staff present. So if two business partners take their 12 office staff out to celebrate winning a new contract that’s fine, the expenditure is allowable and there is no need to restrict the element that relates to the proprietors. The ‘motive’ is very important. Any entertainment to boost staff morale is an allowable cost as it is a benefit to the business. If there is a ‘relationship’ between the proprietors then the motive becomes less clear – most obviously when the staff member is also a relative. In these cases the expense could potentially be a ‘personal’ expense. But, if the relative is included in a large group then the expenditure is allowable. So a Sole Trader taking all of his staff out to dinner would be allowable however if he took his son out alone the position would be doubtful. In small businesses often friendships will develop and this doesn’t prevent you from claiming staff entertaining but the amount of entertaining must be kept ‘within reason’. I can’t see your employees being very happy about coming out for the night to celebrate winning a new contract but then having to pay tax on it! But better still there’s the.. Expenditure of up to £150 per head on an annual staff function can be exempted from both Income Tax and Employer’s National Insurance. It doesn’t even have to be a single function it can be several events as long as the total value (including VAT) does not exceed £150. The good news is that the cost per head is calculated by dividing the total cost pf the event by the total number of people attending, including spouses and guests so sometimes increasing the size of an event can reduce the cost per head. Another way to keep the cost to £150 per head is to ask staff to reimburse any costs over £150 however this may not be good for morale. Asking for a fixed contribution in advance may be more acceptable to staff. When does it become Business Entertaining? 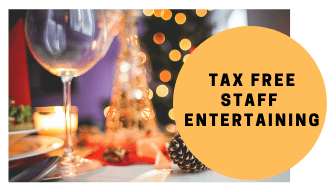 Where customers are present it may become business entertaining rather than staff entertaining and then the business is unable to claim a tax deduction however there is not tax charge on the staff attending the event. For expenditure not covered by the annual part exemption you can get a voluntary settlement but it comes at a cost. Basically the employer can negotiate a voluntary settlement with HMRC to pay all the Income Tx and National Insurance. This payment is also tax deductible. If you’d like to do this then please get in touch as it is sensible to approach HMRC first.